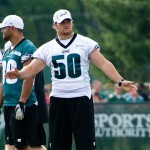 What’s Left From the McNabb And Kolb Trades? As recently as last offseason, it looked like the assets acquired in the Donovan McNabb and Kevin Kolb trades would play a major role in re-shaping the Eagles’ defense. But looking ahead to 2013, that probably won’t end up being the case. The Eagles apparently like what they’ve seen from the 13-3 Falcons this season. Earlier today, a report surfaced that they’d take a look at Atlanta offensive coordinator Dirk Koetter. And now, Jay Glazer of FoxSports.com reports that the team has asked for permission to interview Falcons defensive coordinator Mike Nolan and special teams coordinator Keith Armstrong. 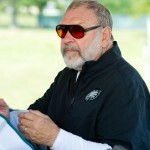 Twitter Mailbag: Does Kolb Have the Inside Scoop On Eagles? Do the Eagles have to worry about the former QB stealing signs? Plus, a look at the team’s primary concern heading into Arizona. This Sunday’s game in Arizona is richer than anticipated when it comes to storylines. Kolb not only took over as the Cardinals starter but is playing fairly well and for a winning team. There are only four 2-0 teams in the conference, and the Eagles and Cardinals are two of them. The former second-round pick out of Houston gets to face his old team in a meaningful game, going up against the man who took his job. Let’s take a trip down memory lane today, shall we? Before Sunday, the last time the Eagles faced the Ravens was on Nov. 23, 2008. The game is less remembered for its result – a 36-7 Baltimore victory – than what happened when Andy Reid’s offense took the field in the second half. Donovan McNabb was in his 10th season with the Eagles, ninth as a full-time starter. From the moment he took over as a rookie until that day at M&T Bank Stadium, he had never been pulled because of performance. But with the Eagles trailing 10-7 at halftime and McNabb struggling (8-for-18 for 59 yards and a pair of interceptions), Reid decided to go with Kevin Kolb. Four. That’s not a lot to work with for the former first-round pick, who has fought back from microfracture knee surgery and a torn ACL to try and get back in the mix. But Graham says he’s thankful for every morsel he’s fed. Kevin Kolb‘s rocky start in Arizona has not gone unnoticed by his former teammates. It’s hard to imagine things getting much worse for Kevin Kolb. The former Eagles second-round pick didn’t do much last night to make his case for being the Cardinals’ starting quarterback, going 3-for-6 for 22 yards. Kolb completed his first three passes as Arizona scored on its opening possession, but then things went downhill. He was sacked three times, including once in the end zone, for a safety. The offensive line deserves criticism too, but Kolb is now 5-for-15 for 47 yards, no touchdowns and an interception in the preseason. To make matters worse, Kolb’s opponents are now ripping him. Eagles Wake-Up Call: What’s the No. 1 Concern? Before training camp started, my No. 1 concern for the Eagles was simple: Would the team’s plan at backup quarterback be good enough? But the truth is, we won’t know the answer to that question unless (until?) Michael Vick gets injured and Mike Kafka (or perhaps Nick Foles) has to enter a regular-season game. Now that camp’s over, though, a new concern has emerged: Will Demetress Bell be ready to go in Week 1 vs. the Browns? It’s hard to believe less than a year has passed since the Eagles traded Kevin Kolb to the Arizona Cardinals. At the time, it seemed like Kolb would finally get his chance. After sitting patiently behind Donovan McNabb, suffering an injury in the first game of the 2011 season and getting passed over for Michael Vick, Kolb signed a six-year, $65M contract and appeared set to be the Cardinals’ signal-caller for years to come. But things didn’t exactly go according to plan.